Copyright 2015 Times Publishing Company. All Rights Reserved. The Brass Tapknows its customers can go just about anywhere to find a good beer these days. In an effort to offer a more authentic experience beyond sampling the hundreds of beers it sells on tap and in bottles, the chain is opening its own microbrewery inside its bar on N Dale Mabry Highway in Carrollwood. The move to brew its own beer comes about a year after the chain abruptly closed its downtown St. Petersburg bar next to Rococo Steak. Despite the closure, the chain is still expanding aggressively, with four franchise locations poised to open in Florida this year and five others in the works in Texas, North Carolina and California. And with more competitors saturating the market, such as World of Beer and the Yard House craft beer and restaurant chain, you have to stand out. “It’s amazing how many people want to open a brewery,” Tristano said. Microbreweries are sprouting in record numbers in Tampa Bay and across the country. The industry recorded a 127 percent spike in the number of breweries that opened in 2014 compared with 2012, according to the Brewers Association trade group. More than 600 breweries opened in the United States last year, including Coppertail Brewing Co. in Tampa. In St. Petersburg, 3 Daughters Brewing opened in December 2013, and a half dozen others, such as 7venth Sun Brewery in Dunedin and Big Storm Brewing Co. in Odessa, opened in 2012. 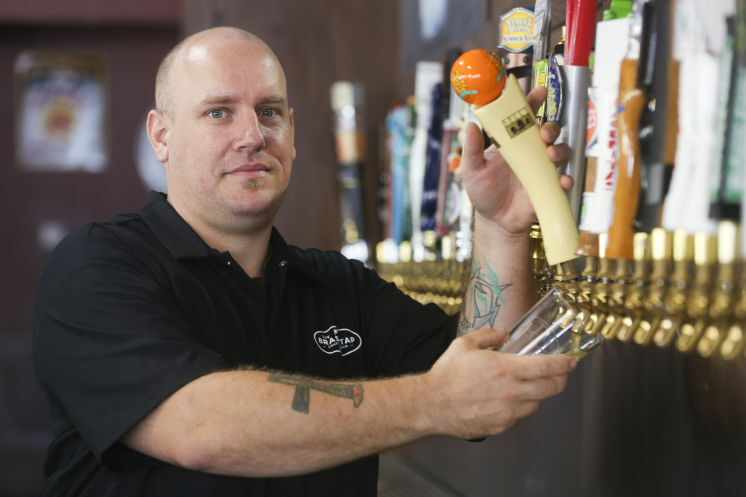 Rory Malloy, the Brass Tap’s new brewing operations manager, will brew beer from a two-barrel “nano” system in a small brewery marked off by a glass wall from the rest of the Carrollwood bar. The beer will be offered for sale at the bar, and customers can watch and ask questions while Malloy brews. He hopes to brew his first beer by the end of the month. The concept has been in the works for nearly two years, Elliott said. The Brass Tap worked with Cigar City Brewing CEO Joey Redner on the concept. Cigar City will be among the first of many local breweries invited to brew a guest batch of beer at the Brass Tap microbrewery, Elliott said. The chain hopes to partner with many of Tampa Bay’s local breweries, and some national ones too, such as Samuel Adams and Founders. The idea isn’t to compete with breweries for customers. It’s to partner with them. The Brass Tap may offer home-brewing courses at the microbrewery. This entry was posted on Tuesday, June 16th, 2015 at 9:00 am and is filed under Beer, Beverage, Economy, Franchise Activity, Growth, Growth Opportunities, Ingredient, Local Foods, Microbrewery. You can follow any responses to this entry through the RSS 2.0 feed. You can leave a response, or trackback from your own site.